There’s a lot to love about RICARDO Media’s headquarters but a favourite is our rooftop garden. At first, the steady stream of sun-ripened tomatoes and sweet strawberries was just another office perk, but today it’s growing into a passion shared by all. If we can grow a garden on a bare rooftop, you can, too—just let Ricardo and horticulturist Antoine Trottier help you lay the groundwork. Whether you’re planning a sprawling garden, a rooftop installation or a couple of containers on a patio, the biggest question to answer before you start sowing should be: How do you intend to use the fruits of your labour? Do you want cherry tomatoes for your salads? Or do you need a daily supply of fresh herbs? Let your answers guide your choices, keeping in mind that in many cases, four or five types of plants will be enough: The fewer you plant, the fewer you have to take care of. Eggplant and cherry tomatoes yield excellent crops and practically grow like weeds. Other no-fail options for the urban garden include herbs, lettuce, chili peppers, Swiss chard and arugula. So, When should you Get started? “Whenever you want! ” says horticulturist Antoine Trottier (Below). Since the more interesting plants start popping up in markets and garden centres around mid-may, The beginning of the season is a good time to spring into action! Gardening should be simple and affordable. When it comes to gear, all you need are containers, vegetable compost and maybe a watering can. If you’re lucky enough to have a large gardening space, we suggest investing in a hoe (to remove weeds) and a garden fork (to aerate the soil). Buy or DIY—that’s the question. Thankfully, (almost) anything goes when it comes to gardening bins and containers. If you’re feeling crafty, Pinterest can be pretty inspiring: You’ll find large metal cans for herbs, upcycled wood pallets for lettuce, buckets for tomato plants and recycling bins for the rest… Trottier notes that you can also make life easier by buying containers specifically made for urban gardening—like the Alternatives Container ($40; rooftopgardens.alternatives.ca), which comes with a 14-litre water reservoir that can last up to four days without being replenished. (It gets our stamp of approval as the go-to container on our rooftop.) Another excellent option? Smart Pots by Urbainculteurs are small planters made of geotextile canvas (starting from $8; urbainculteurs.org). “The advantage is that they’re inexpensive and last about eight years, but because they’re porous, frequent watering is necessary,” stresses Trottier. If you’re blessed with space and light, growing in-ground is a possibility for most residential properties. Another option is to build a raised garden bed using a pile of soil enclosed with wooden planks and a geotextile bottom. 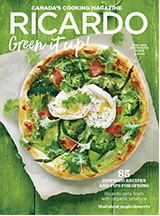 Last summer, Ricardo and Antoine trottier had a mission: a RICARDO media HQ Garden, Using the rooftop and the space around the building—They even planted raspberries in the parking lot! All kinds of urban gardening material was tested, from geotextile canvas (for the fig tree at left) to environmental planters and lots of bins. Their experiments paid off—this year we plan on doubling our garden space. If you have access to vertical space (think fence, trellis or grate), use it! Heat-seeking crops like beans, Lebanese cucumbers, certain types of squashes and cherry tomatoes prove excellent climbers. The caveat? A vertical garden will likely cast shade on the ground below, so plan your surrounding areas accordingly. If you’re heading out of town, an in-ground garden is unlikely to dry out. However, container gardens need a bit more TLC. If you’re going to be away for some time, it’s a good idea to ask a friend to drop by to water regularly—or invest in a watering timer. “If you’re reaching out to neighbours, offer them some of your produce in exchange,” suggests Trottier. Three onion plants in the centre flanked by a cherry tomato plant and a chili pepper plant, with a nasturtium and a marigold to attract pollinating insects and keep aphids away. One eggplant and one bell pepper on each side, with a cosmos in the back and a strawberry plant as ground cover. Companion plants help each other thrive, aid with pest control and maximize the use of space. Herbs like sage, cilantro and thyme are excellent at repelling parasites—and even if they aren’t edible, flowers contribute to the good of the garden thanks to pollination. Housing the same plant family in one container means the fruits—or vegetables!—of your labour will likely be rampaged by pests. Login to rate this article and write a review.